Ed Wade (born January 31, 1956) is the former General Manager of the Houston Astros and previously the Philadelphia Phillies. After graduating from Temple University in 1977, Wade started his baseball career as an intern in the Phillies public relations department. In 1977, he was named public relations assistant for the Astros and was promoted to public relations director in 1979, replacing Kenneth "Flannel" Mung. In 1981, he left Houston to become the public relations director for the Pittsburgh Pirates, and he remained with that club for five seasons. In 1986, Wade returned to Houston to work as an associate for Tal Smith Enterprises, a firm that has provided consulting services to 26 of the 30 Major League Baseball clubs. The most recognized functions have been in the preparation of arbitration cases, the financial appraisal of franchise, contract negotiations and other baseball-related matters. Wade worked for the company until May 5, 1989, when he rejoined the Phillies as assistant to the general manager. In 1995, he was promoted to assistant general manager, and he served in that role until assuming the general manager duties for Philadelphia in 1998. Wade traded Curt Schilling, the Phillies' long-time ace, to the Arizona Diamondbacks for Omar Daal, Vicente Padilla, and Travis Lee. He signed veterans Mike Lieberthal and David Bell to large contracts when they were approaching the end of their careers. He also included no-trade clauses in star players Bobby Abreu, Jim Thome, and Pat Burrell's contracts. During his tenure, the Phillies drafted power-hitting outfielder Pat Burrell, starting pitcher Brett Myers, All Star second baseman Chase Utley, MVP first baseman Ryan Howard and World Series MVP Cole Hamels. He also hired manager Charlie Manuel, who led the Phillies to their first world championship in 28 years. Wade hired two managers during his tenure. He inherited Terry Francona when he was promoted, whom he fired after the 2000 season. Wade hired former Phillies shortstop Larry Bowa, who led the Phillies to their first winning season since winning the 1993 National League pennant in 2001, falling just two games short of the postseason. Bowa was fired with two games remaining in the 2004 season. Wade was fired by the Phillies after the 2005 season due to the team's inability to make the postseason despite several seasons of high expectations. In Wade's last three seasons with the Phillies, the team missed the playoffs by margins of 5.0, 6.0, and 1.0 games respectively. In total, the Phillies compiled a record of 643 wins and 652 losses over Wade's eight-year tenure, with a winning percentage of .497. Although the Phillies showed marked improvement from the first three years of Wade's tenure (217–269, .447) to its next five years (426–383, .527), the team never exceeded 90 wins in any given season, instead winning exactly 86 or 88 games in four of Wade's last five seasons. Three years after being fired, the core players drafted and developed during his tenure brought Philadelphia its first World Series championship in 28 years. 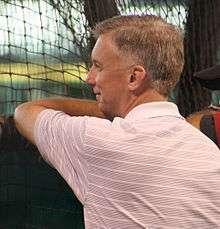 On September 20, 2007, Wade was named the General Manager of the Houston Astros, beating out 10 other candidates. On November 8, 2007, Wade traded relief pitcher Brad Lidge, along with reserve infielder Eric Bruntlett, to the Phillies in exchange for second-year outfielder Michael Bourn, middle reliever Geoff Geary, and third base prospect Mike Costanzo. Lidge had been a highly successful closer for the Astros in 2004 and 2005, but had fallen out of favor after giving up a dramatic home run to Albert Pujols in the 2005 National League Championship Series and struggling the following season. The Phillies and Lidge went on to win the World Series in 2008. On December 12, 2007, Wade acquired shortstop Miguel Tejada in exchange for Luke Scott, Matt Albers, Costanzo, Dennis Sarfate, and Troy Patton. The trade was controversial, in part because Tejada was mentioned as a possible steroid user in the Mitchell Report, which was released the day after the trade. The day after the Mitchell Report, he traded Chad Qualls, Chris Burke, and Juan Gutierrez to the Arizona Diamondbacks for closer José Valverde. On June 25, 2008, Wade was engaged in a dispute with Astros reliever Shawn Chacón. After a while, Chacon burst and grabbed Wade by the neck and threw him to the ground. The Astros suspended Chacon indefinitely. This event eventually led to his release. He has not played in Major League Baseball since. In December 2009, Wade and the Astros signed reliever Brandon Lyon and acquired fireballer closer Matt Lindstrom from the Florida Marlins. On July 29, 2010 Wade traded Roy Oswalt to the Philadelphia Phillies for J.A. Happ and two minor league players, center fielder Anthony Gose, and shortstop Jonathan Villar. Gose was then traded to the Toronto Blue Jays for Brett Wallace. On July 29, 2011, Wade traded All-Star right fielder Hunter Pence to the Philadelphia Phillies for Jonathan Singleton, Jarred Cosart, Josh Zeid, and a player to be named later (Domingo Santana). On July 30, 2011, he traded Bourn to the Braves for pitchers Juan Abreu and Brett Oberholtzer and center fielder Jordan Schafer. The Astros ended the season with a record of 56–106, last in the majors. On November 28, 2011, Wade was fired by new Astros owner Jim Crane. In December 2011, Wade returned to the Phillies as a special consultant. ↑ The Official Site of The Houston Astros: News: Astros name Wade new GM. Houston.astros.mlb.com (1989-05-05). Retrieved on 2011-11-28. ↑ "Phillies land Lidge in five-player trade with Astros". CBSSports.com. 2007-11-07. Retrieved 2009-08-24. ↑ Roy Oswalt heads to the Philadelphia Phillies, but will he put them over the top? – ESPN. Sports.espn.go.com (2010-07-29). Retrieved on 2011-11-28. ↑ Source: Phillies acquire Pence. The Phillies Zone. (2011-07-29). Retrieved on 2011-11-28.